Joaquin Rodriguez (Katusha) produced a trademark uphill sprint into Assisi to take stage 10 and the maglia rosa of the 2012 Giro d’Italia. The pocket-sized Spaniard timed his finish perfectly to jump clear ahead of Bartosz Huzarski (NetApp) and Giovanni Visconti (Movistar) in the final 75 metres. 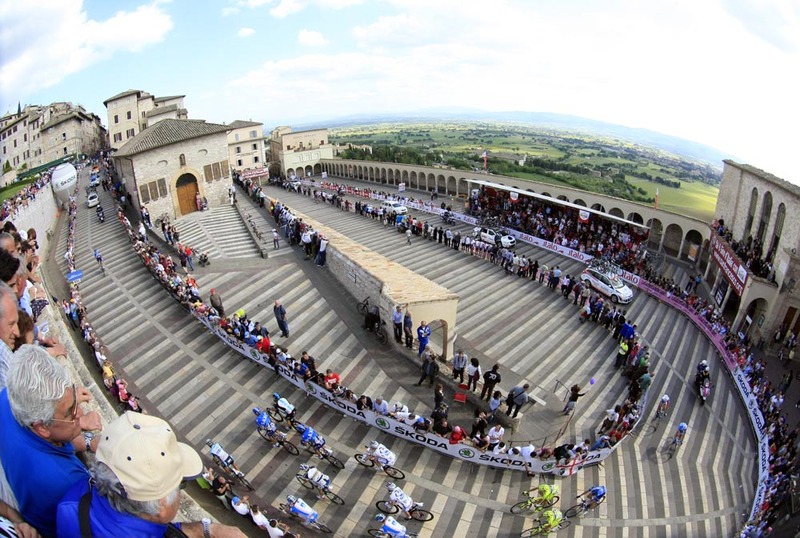 He picked up the 20 bonus seconds on offer to the stage winner to move ahead of today’s leader Ryder Hesjedal (Garmin-Barracuda) and pull on his first ever pink jersey in the stunning surroundings of Assisi. In undoubtedly the most exciting day’s racing in this year’s Giro, Rodriguez’s win came on a stage that seemed written for his talents; a largely flat affair ending in a brutal and stinging 15% climb up to the finish. An early break of Miguel Minguez (Euskaltel), Guillaume Bonnafond (Ag2r-La Mondiale), Francesco Failli (Farnese Vini-Selle Italia), Matthias Brandle (NetApp) and Martijn Keizer (Vacansoleil-DCM) stayed ahead through the lumpy roads in the heart of Italy until just 7km to go when the tempo of the Garmin-Barracuda and Katusha teams became too strong. 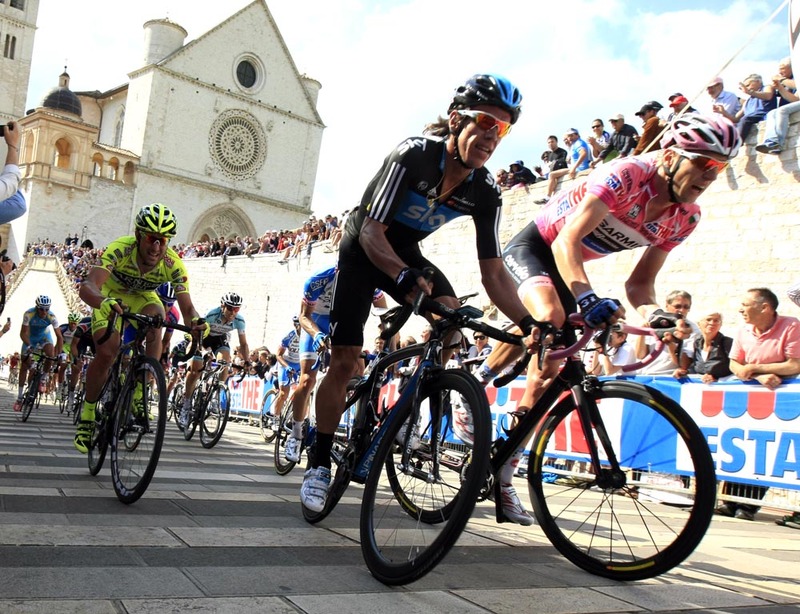 The attacks started flying as the final ramp into Assisi approached with 3km left. The peloton looked to be climbing stairs up as it flew up the striped pavement and into the narrow streets of the medieval city, led by Rabobank’s Tom Jelte Slagters. As Rodriguez waited until the opportune moment before unleashing his unbeatable uphill kick, NetApp’s Huzarski pulled a result out of the bag to narrowly hold off a fast finishing Visconti. Hesjedal dug in deep to finish sixth on the stage and maintain a second place in the general classification, although today’s biggest loser was Frank Schleck who lost 26 seconds on Rodriguez and now sits 1’25 on the GC. Other overall contender Michele Scarponi also dropped back at the finish and is also over a minute back on Rodriguez. 3. Giovanni Visconti (Ita) Movistar s.t. 5. John Gadret (Fra) Ag2r-La Mondiale s.t. 6. Ryder Hesjedal (Can) Garmin-Barracuda s.t. 7. Tom Jelte Slagter (Ned) Rabobank s.t. 8. Dario Cataldo (Ita) Omega Pharma-QuickStep s.t. 9. Roman Kreuziger (Cze) Astana s.t. 10. 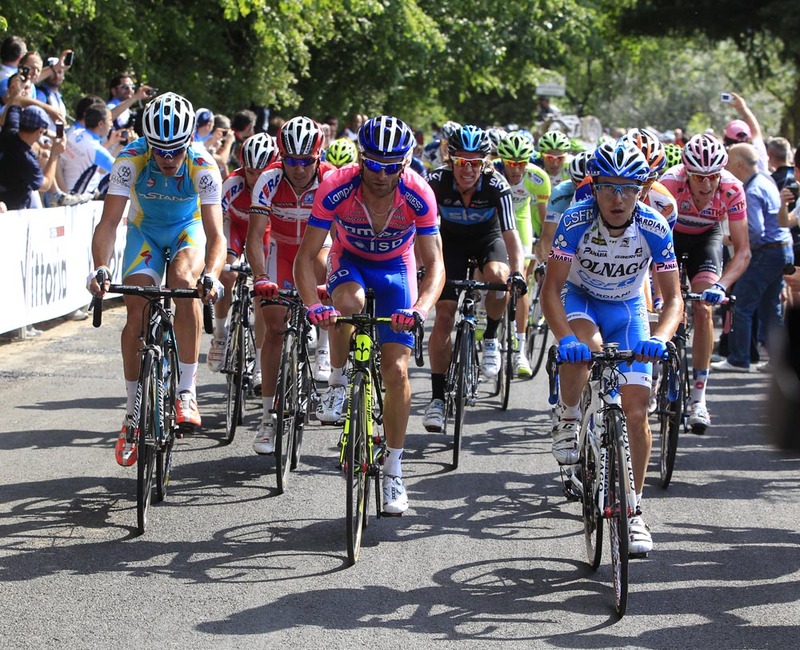 Rigoberto Uran (Col) Sky s.t.